Taipei Marriott Hotel is the city’s largest integrated destination complex with a 320-room urban retreat hotel, shopping and dining arcade, and a state-of-the-art convention center. With a prime location in the middle of the Dazhi District, the hotel offers rooms with panoramic views of Taipei city and the botanical gardens. 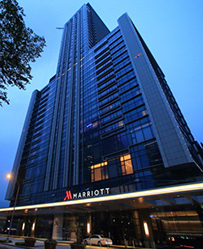 Taipei Marriott is an urban city resort, located along Keelung River, with convenient access to Neihu Technology Park, Nangang Software Park, and Taipei World Trade Center Nangang Exhibition Hall. Facilities include four restaurants and a bar serving authentic Cantonese cuisine. 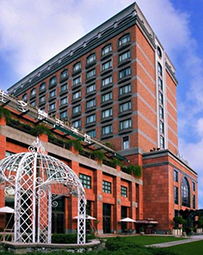 Grand Victoria Hotel is located in the Dazhi Miramar business district in the Chungshan District in Taipei City. 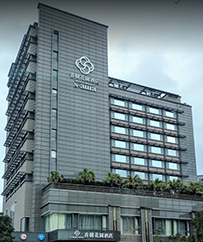 A stone’s throw from the Neihu science and technology district, the Hsichi and Nankang industrial districts, the shopping paradise of the East District, and short drives from Taipei Songshan Airport and Taoyuan International Airport, Grand Victoria Hotel is the hotel of choice whether you are traveling for business or pleasure. The latest addition to the ever-changing landscape of Taipei City, Grand Victoria Hotel is a quintessential masterpiece of modern luxury, representing a fusion of classic Victorian architecture of the 19th century with contemporary elements of the 21st century. S-aura Hotel & Banquet is located in the Miramar shopping mall, close to the MRT Jiannan Station and Taipei Songshan Airport. The hotel is adjacent to many popular destinations including Neihu Technology Park, Miramar Entertainment Park, and Carrefour Hypermall. You can conveniently connect to other Taipei commercial areas and attractions as well. S-aura Hotel & Banquet provides sophisticated accommodations and all the comforts of a luxurious hotel. The superb rooms of this Taipei City hotel celebrate vivid city views with clean, elegant designs. 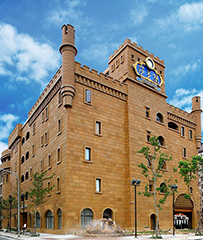 Sato Castle Hotel is a 20-minute walk from the city center, and a five-minute walk from Miramar Entertainment Park and Miramar Ferris Wheel. Nearby points of interest include the temple, the palace, and museums. The hotel offers 51 rooms fitted with an in-room safe, a minibar, a sofa, a flat-screen TV, and a writing desk for a comfortable stay in Taipei. Guests can make use of open bathrooms with a spa bathtub, a hairdryer, and a shower. This hotel is only 350 meters from MRT Dazhi underground station, and a five-minute drive from Sung Shan airport. Cars are available for rent at Sato Castle Motel. Guests can make use of a wellness center, hot tub, and sauna, along with steam baths and reflex massage. Strategically located near the Miramar Entertainment Park and Neihu Technology Park, Capital Hotel Dazhi offers one-stop fun solutions that involve shopping, dining and movie-going with local amenities and attractions (National Palace Museum, Martyrs’ Shrine, etc.) just minutes away. Not only does the hotel’s subtly lavish interior encapsulate craftsmanship that befits top-notch accommodations, its professional, enthusiastic and attentive staff is also ready to meet your business travel or vacation needs.